Don't know how to wear your high high-top sneakers? Cuff your trousers, slim down the leg of your trousers and quite possibly look to this offering from Margiela. 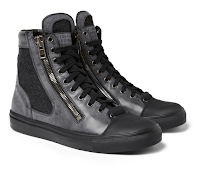 This new leather and wool high top for Fall offers a design-inspired solution for several different pant quandaries. Keep them zipped with slim legs and also cuff 'em high. 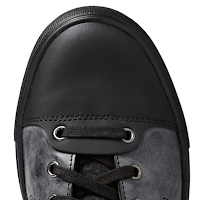 Zip them down for a wider hem or longer inseam lengths and get some cool crunch action atop your sneakers. 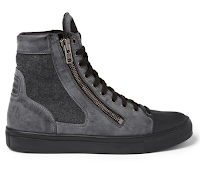 Whatever your pleasure, the wool insets, premium suede panels and sturdy double-zip on this attractive well-executed sneaker is another winner from a winning design camp. 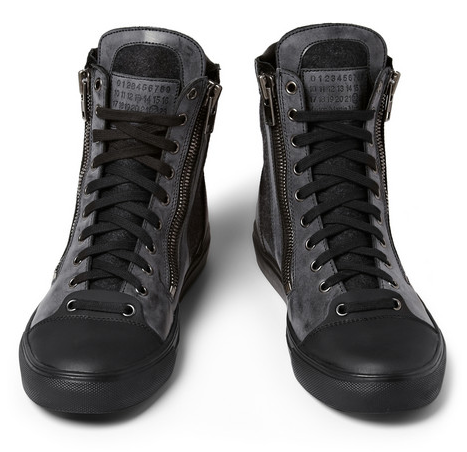 Available now, but going fast, at Mr.Porter.com.